Do you often struggle to get your hair looking the way you want it to at home? Sometimes the solution may simply lie in the humble hair tool: the hairdryer. The hairdryer is probably one of the most common at-home hair tools we reach for, yet it can also be one of the trickiest. Here are some tips that can help you use the hair dryer to its fullest potential, and to achieve great daily style. Want to give your hair the perfect finish? Then the cold setting is your best friend. Give your hair a few quick blasts at the end once your hair is totally dry. The cold air will help seal the cuticles and allow them to lay flat, creating a sleek, shiny look. The best thing for your hair’s health is actually letting it air-dry before blow-drying. Hair is vulnerable when it’s wet, so make sure to dry your hair according to your texture. Fine-to-medium hair can air-dry a bit longer, to about 80 percent dryness, whereas thicker hair should only be about 50 percent dry before blow-drying, especially if you’re trying to straighten your curly hair. If you have curly or wavy hair, enhance its natural texture by adding product when it’s very wet, squeeze out the excess with your hands, and wrap it up gently in a microfiber towel or t-shirt. Once your curls are no longer dripping wet, you can start blow-drying. We list some of the tools you’ll need for either straight or curly hair below. 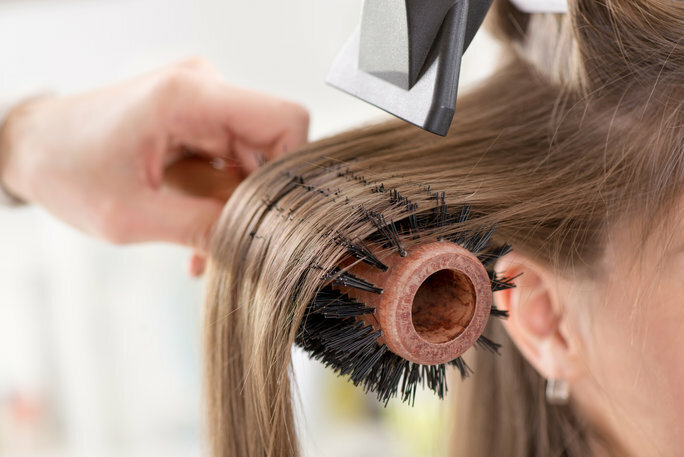 But in general, you may actually be damaging your hair with cheap blow dryers that either come in a super hot setting or super cool settings, with nothing in between. Quality hair dryers tend to come with hair-saving smart features like high power, multiple heat settings, a cool shot, and ionic air technology. Ionic air technology sounds fancy, but what it actually does is help with frizz, creates shine, and minimizes blow-dry time. The technology in ionic hair dryers helps break down water molecules faster, which makes the hair dry faster. The less time your hair is under heat and the more control you have over the temperature, the healthier it will be. One dryer that we recommend is the Dyson Supersonic dryer, which we use in our salon. The Dyson dryer is very quiet, compact and boasts multiple speed settings. The next time you’re at Hairloom, experience for yourself how it feels! 4 Have an event the next day? Try to wash and blow dry your hair the night before in order to give it time to settle. If your hair is long, try loosely braiding it and tying into a top knot. Sleeping on it the night before will allow any frizz to settle, and your hair will be smoother, with some natural looking waves. Washing and drying it on the day of often results in frizzy and unruly hair. It’s better to start in the front – the temples, hairline, and crown – before moving backwards to the nape. That way you tackle the most visible parts first. That’s because by doing it the opposite way, the hair in the front would have dried by the time you get there, making it harder to straighten or style. Especially if you have bangs! The front of hair tends to be the most challenging to smooth, yet is also the most visible part of your style, so it’s best to get that done first. Want some volume for your hair? One way is to flip the hair upside down and brush it so that your roots are going the opposite direction, while blasting it briefly with the blow-dryer. You can also use a wide-tooth comb or your hands. If you want extra volume at the crown, you can set the top of the head with larger rollers. Put in the rollers while the hair is still warm from the blow-dryer. Pin it up with a bobby pin, and let it cool, so you get full volume and a nice wave. Which dryer should you get? It should be at least 1,800 watts, with multiple heat and air settings. Use medium heat to predry hair; high heat to set your hair’s shape, and cool air to finish off a style. Nozzle: Many people get rid of it, but it’s really important to use the nozzle! It is essential to a smooth look and keeps hair from getting too close to the heat. Round brush: This versatile tool can help straighten, make ends flip, or create waves. The bigger and broader the surface area of a brush, the faster the drying time. Brushes with vents also shave off minutes. Hair clip: Use this to keep layers separate and easy to manage, while preventing damage caused by over-drying sections. Which dryer to get? 1,400 watts is enough, as curls don’t require high temperatures. Stick with the low and medium settings. Diffuser: An essential component for creating soft, frizz-free curls. Look for one that’s concave in the middle and not flat. This allows curls to rest inside and creates a natural shape.